There are moments in media when all narratives point in the same direction, when the press seems to see events with an almost singular vision. Such a moment arrived for President Obama last week. Driven by the ideas from President Obama’s bipartisan debt commission, and the vocal reaction to it, the U.S. economy supplanted the midterm elections atop the mainstream news agenda last week for the first time in two months. From November 8-14, the economy accounted for 15% of the newshole according to the Pew Research Center’s Project for Excellence in Journalism. About half that coverage focused on the draft proposal from the National Commission for Fiscal Responsibility and Reform, which—in calling for some tax increases and spending cuts—generated criticism from the left and the right. The No. 2 story, at 12%, was the continuing fallout from the Nov. 2 congressional elections—which produced major Republican gains—with the narrative reinforcing a moment interpreted as a stinging rebuke for the president. Obama’s trip to the G-20 summit and Asia registered as the third-biggest story last week, filling 9% of the newshole. Much of that coverage highlighted the president’s inability to secure a trade deal with South Korea and an apparent failure to ease economic tensions with China. Indeed the media narrative last week portrayed a weakened president continuing to be buffeted by events from all sides. His commission’s suggestions on deficit reduction were nearly drowned out by widespread criticism of them. The election coverage highlighted the road ahead for newly ascendant Republicans in Washington and in state houses. And the message coming out of the Asian trip was of deals not consummated and expectations not met. To make things worse, the events on the foreign trip seemed to come as a surprise for a White House that by week’s end was being derided for not knowing what would await the President overseas. Two very different subjects rounded out the top-five story list last week. It wasn’t exactly the Love Boat as the saga of a disabled Carnival cruise ship—with several thousand passengers on board—was the No. 4 story at 4% of the newshole. Rescued passengers told of overflowing toilets and scarce food supplies. Next, also at 4%, was President George W. Bush’s new memoir media tour—which included interviews with people ranging from Matt Lauer to Rush Limbaugh. The book itself appeared not to break much dramatic new ground. In the first week in November, Bush made news for acknowledging he had approved the waterboarding of terror suspect Khalid Shaikh Mohammed. One attention-grabbing nugget last week was a reconciliation of sorts between Bush and rapper Kanye West. In his book, Decision Points, the ex-president criticized West’s denunciation of him as someone who “doesn’t care about black people.” Last week, West offered a mea culpa for remarks made in “frustration” in the wake of Hurricane Katrina. 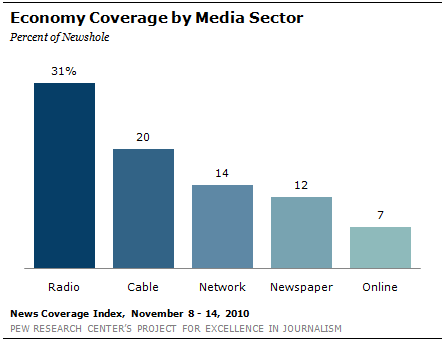 Last week, coverage of the economy led in four media sectors—newspapers (12%), network news (14%), cable (20%) and radio (31%). And the leading economic storyline, by far, was the debt commission blueprint released on November 10. That outline, which included a number of proposals that will face tough political sledding, generated an immediate reaction—and it wasn’t very favorable. In the November 10 CBS newscast, correspondent Chip Reid declared that, “In the fifty-page draft proposal, pain is everywhere.” Ticking off provisions such as cutting 200,000 federal jobs, more than $100 billion in defense cuts, a reduction in some Social Security benefits, moving the retirement edge up from 67 to 69, and ending the mortgage interest deduction for more valuable homes, Reid summed up the mood on Capitol Hill. “The knives are already out on both sides of the aisle,” he said. And talk shows from both left and right political poles seemed to bear that out. If the early responses to the deficit proposals were one difficulty for the president, the election post-mortems were another. A PEJ study of the media’s initial post-election message—both on mainstream and social media platforms—found that no single narrative reverberated throughout the news ecosystem in the immediate aftermath of the results. But by last week, the biggest chunk of coverage—more than one-third—focused on the path ahead for victorious Republicans. A November 8 New York Times story focused on the GOP agenda at the state level. “Republicans who have taken over state capitols across the country are promising to respond to crippling budget deficits with an array of cuts, among them proposals to reduce public workers’ benefits in Wisconsin, scale back social services in Maine and sell off state liquor stores in Pennsylvania…" the story noted, adding that Republicans gained about 700 seats in state legislatures and added at least five more governor’s offices. Another aspect of the Republican story last week focused on the role the tea party would play in Washington. Last week that narrative took the form, in part, of favorite Michelle Bachmann’s decision to vie for a House leadership position. A November 8 USA Today story quoted Bachmann saying, "It isn’t that I need to be in the leadership. It’s the ideas and ideals of the Tea Party that are important and need to be represented at the table." A few days later, however, she ended her bid to become Republican House Conference chair. 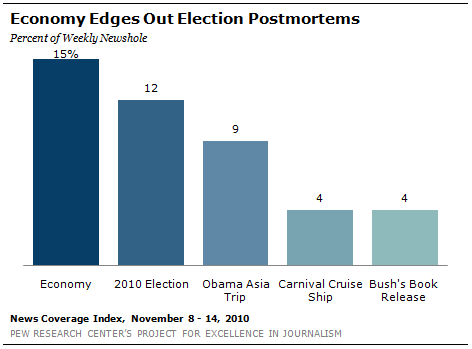 A smaller, but still significant element of last week’s coverage involved the impact of the elections on Obama himself. There had been a raft of analyses assessing whether the president seemed to get the message from the election, dissecting his post election remarks and wondering whether he would opt for compromise or a more combative style going forward. Often presidents with difficulty at home find refuge abroad. That made the week that was all the more painful for the President. Obama’s trip to Asia was the top story last week in one sector, online at 13% of the newshole studied. And the news wasn’t good for the White House. A November 10 Washington Post story on an Obama speech in Jakarta Indonesia—a city where he lived as a boy—noted the president’s eroding popularity, overseas and at home as well. The more damning press narrative, however, came in the aftermath of what the media saw as a largely unsuccessful summit for Obama. The week ended with the ultimate indignity coming from some old Washington insiders. The Washington Post Sunday Outlook section led with a piece by political strategists Patrick Caddell and Douglas Schoen suggesting that Obama announce he would not seek re-election now so that he could get more done in the remaining two years. The George Bush media tour was close behind, also at 4%, and generated the most coverage in the online and network news sectors (6% of the newshole.) Those appearances marked the first extended public emergence of the former president, who has largely kept a low profile since leaving office in January 2009. For the most part, Bush was one of the few newsmakers in politics last week who largely avoided talking about Obama. With the focus on his trip to Asia, Barack Obama was the top figure in the news from November 8-14, appearing as a lead newsmaker in 10% of the overall studies. 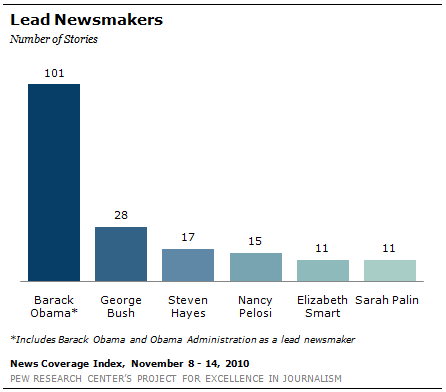 (To be considered a lead newsmaker, someone has to appear in at least 50% of the story.) The next biggest newsmaker, well back at 3%, was the man he succeeded in the White House, George W. Bush. Steven Hayes, who was sentenced to death last week for murdering three family members in a 2007 Connecticut home invasion, was the No. 3 newsmaker, at 2%. He was followed, also at 2%, by Nancy Pelosi, the current Speaker of the House who has stated her intention to run for minority leader in the new GOP-controlled chamber. The fifth-leading newsmaker (1%) was Elizabeth Smart, who last week testified at the trial of the man accused of kidnapping her from her Utah home in 2002 when she was 14 years old. The case attracted a good deal of media attention at the time as did her rescue a year later. Smart was tied by another familiar name among headline generators, former Alaska governor Sarah Palin (1%).